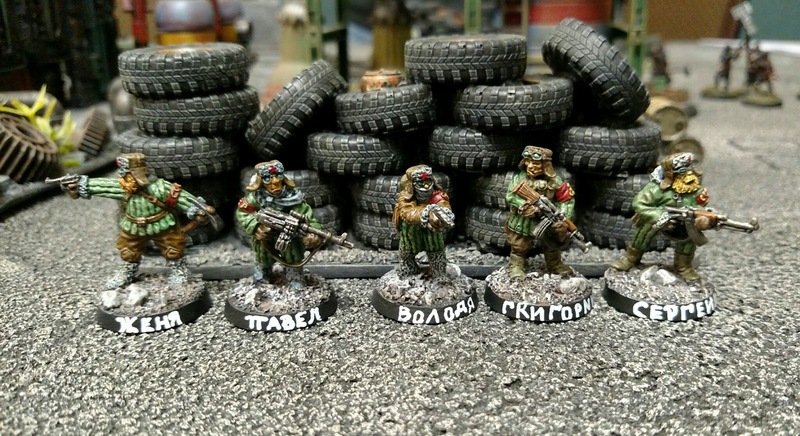 Last year I decided to look into purchasing some select models from Ratnik Miniatures, a small-batch Russian manufacturer distributed by Lead Adventure Miniatures (and sold domestically here in the U.S. of A. by Cool Mini or Not). Imagine my surprise (and glee!) when I strolled over to CMON and saw that the entirety of their Lead Adventure Miniatures stock was on clearance! I quickly pieced together an order, snapping up a half dozen packs of post-apocalyptic figures that I’ve been salivating over for years. Much of this stuff is inspired by the STALKER video games: lots of scrappy scavengers with gas masks and bandoliers and pieced-together military kit. Very heady, atmospheric stuff. 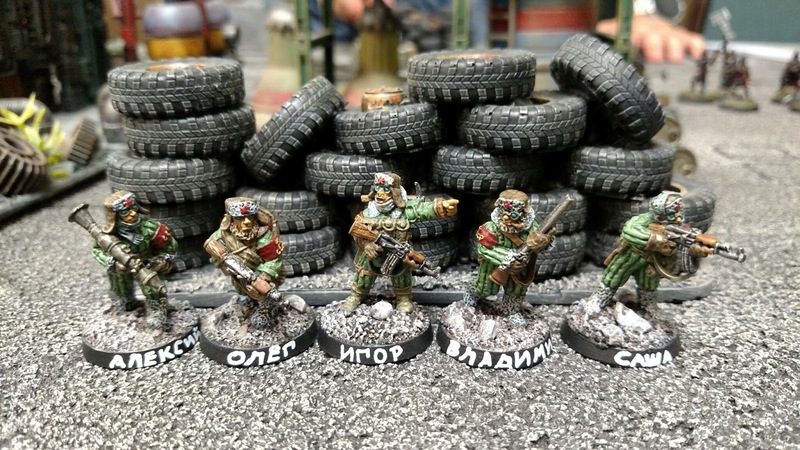 Anyway, the figures arrived and I set about painting up two batches of Russian scavengers, for a grand total of 10 guys. They’re armed with simple 20th-century weapons — no laser rifles here — which fits perfectly with my post-apocalyptic games. As an added bonus (and just to see if I could), I gave each guy a name, written in Russian along the base. Somewhere my college Russian professor is chuckling! I’m sure they’ll be a familiar sight on the wastelands for a long time to come!